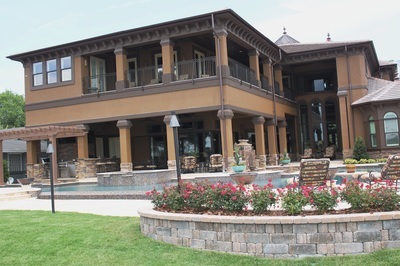 ​A beautiful location on the Halifax River (the inter-coastal waterway) in Ormond Beach, FL was chosen for the residence of Sharon McSwain, the owner of a Florida based residential construction company. The lot, naturally sloping to the shore line, proved to be quite a challenge for the design of the site and outdoor living spaces. Natural views to the water were inviting but space was at a premium. Working within the setback constraints of the narrow rectangular lot and having to elevate the structure out of the flood zone created many challenges for the home designer. In addition, the harsh environment on the inter-coastal waterway required materials that could withstand the corrosive effects of saltwater. Concrete masonry was chosen as the building material of choice not only for strength and longevity, but also for its immunity to salt corrosion. 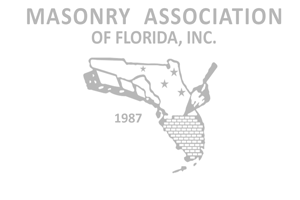 An added benefit (absolutely necessary in Florida)is masonry's termite resistance. The biggest challenge, from an engineering standpoint, was the massive circular tower in front of the structure. After reviewing several options, only reinforced concrete masonry could provide the necessary support and strength the design called required. 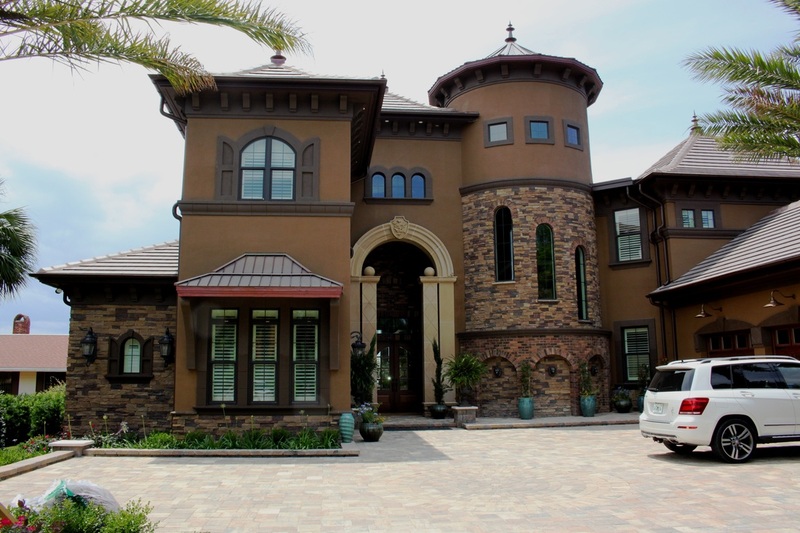 The exterior of the home had stucco applied over the block to create not only a smooth finish, but after painting, a water resistant barrier in this harsh environment. Manufactured stone, an accent element, was chosen for the feel and texture the owner and designer desired. 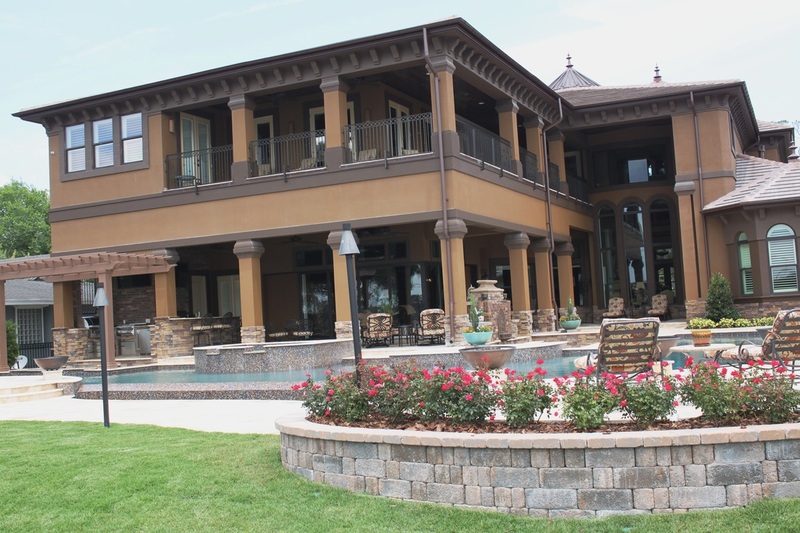 The manufactured stone allowed for consistent installation and no deviations in the color palate (also extremely important when using such a large amount of stone on highly prominent walls). Along with the beautiful views along the inter-coastal waterway there were "site" design challenges to overcome as well. 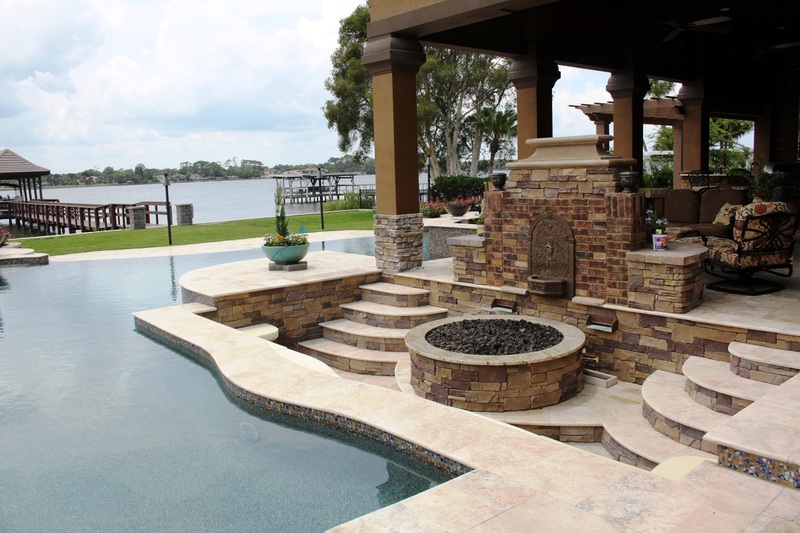 The backyard needed to be able to structurally withstand the wind elements of storms and potentially flood water, along with providing the owner a large and open space to entertain. The solution was to create terraces and patios supported by masonry retaining walls with architectural finishes that emulate stone. These design elements were carried around to the front of the home creating a unified, pleasing design. 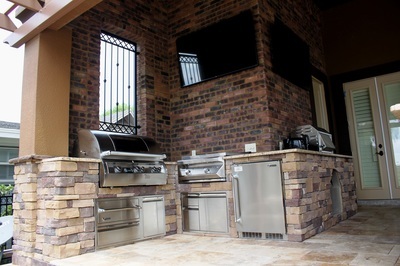 This easy to install material also gave the owners the design flexibility they desired. By utilizing these modular shapes they were able to "design on the fly" as the outdoor spaces began to take shape. Although retaining walls are quite reasonably priced they worked together with pavers and brick to create an outdoor space that achieved an expensive "resort" feel while staying consistent with the overall castle theme of the design. To create a warm ambiance at night, several fire elements were incorporated into the site design. 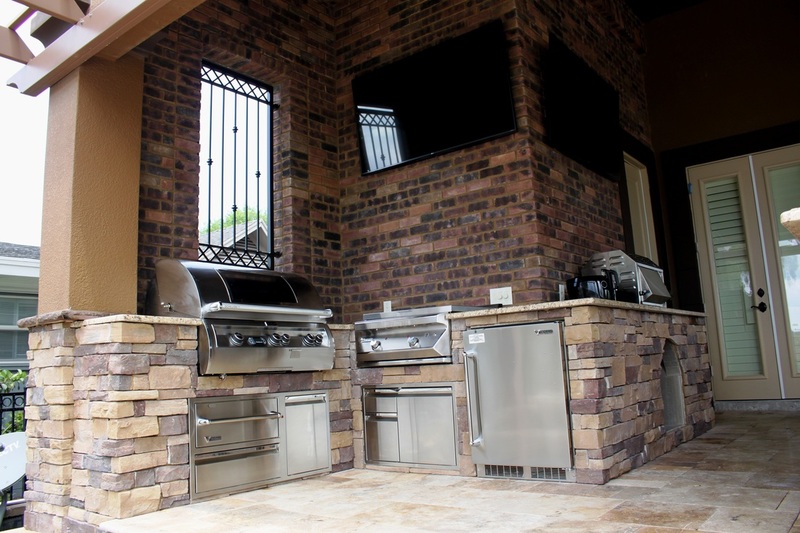 Along with a fire pit, perimeter torches, and a fireplace, there is also a large outdoor kitchen for grilling and entertaining..... all while enjoying the water front lifestyle adjacent to the Halifax River. 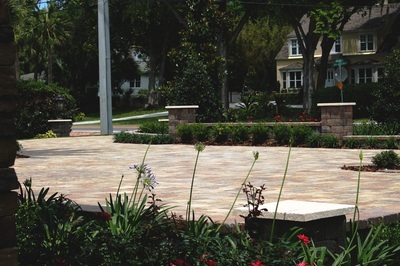 Concrete pavers were chosen for the circular driveway not only for the durability under constant traffic but also to alleviate cracking that would occur on other surface options. 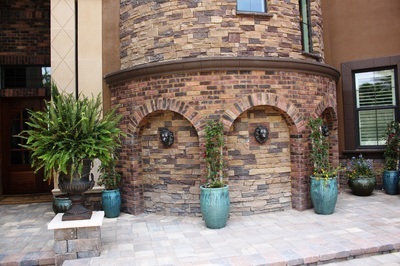 The texture of the pavers blends well with the decorative details along the front of the house. An additional benefit is the pavers are porous allowing for natural percolation of rainfall through the extensive circle driveway and courtyard minimizing runoff and storm water retention. 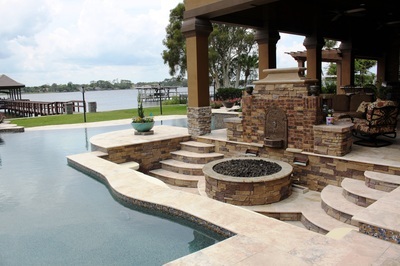 According to the owner, Sharon McSwain, masonry products were chosen because "nothing else fit the bill: Beauty, flexibility, consistent color, and strength! I couldn't be happier".